Ron Snorgrass, has been associated with the auction industry most of his life while growing up in rural Missouri. 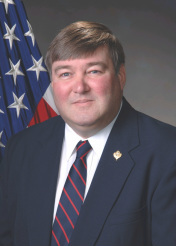 Ron entered the United States Air Force in 1972 and retired in 1992. After retirement he graduated from Utah State University, with a BS in Industrial Teacher Education. Ron is a gifted FAA Certified Pilot and a FAA Certified Airframe and Powerplant Technician. He graduated from the Missouri Auction School in 1994. Ron is also a Personal Property Appraiser and a graduate of the Certified Appraisal Guild of America, CAGA in 1996. Ron was selected as the 2004 Businessman of the Year, 2003 Businessman of the Year and also received the 2003 National Leadership Award by Congress. He is a member of the Utah Auctioneers Association, a Life Member of the National Auctioneers Association, a Life Member of the Veterans of Foreign Wars, a Life Member of the Disabled American Veterans, a Life Member of the Air Force Association and is a proud member of the Civil Air Patrol for over 37 years. Ron is currently serving as Executive Director and President of the Utah Auctioneers Association (UAA) and manages the association on a daily basis. He was also the President of the UAA in 2001 and 2003, he also has served on the UAA 2002 and 2004 Board of Directors as the Past President and CEO. Snorgrass is an award winning Utah Auctioneers Association Auctioneer. Although his specialty is benefit auctions, he also conducts other auctions as well from Antiques to Personal/General Merchandise as a Contract Auctioneer. Ron has conducted auctions and performed appraisals for many organizations and individuals in Utah, Missouri, Nevada, New Jersey, Florida and overseas. A short list of customers include the American Red Cross, American Heart Association, Davis County School District, Copper Hills High School Baseball, Brigham Young University, Ogden Board of Realtors, Big Brother Big Sisters of Southern Nevada, United States Marine Corp/Law Enforcement Foundation, the United States Air Force, Bear River Early Head Start, Mule Deer Foundation and many others. Through his talents, he has helped raise over $5,000,000. Ron has never refused to donate his time and talents to any church or charitable organization that has asked for his help in putting on an auction. He donates not only his expertise but also his time and energy helping organizations prepare for their auctions. Whatever It Is, Wherever It Is, We Can Sell It!